Welcome to Robbie’s Rosewood Cavaliers! An exquisite Blenheim Cavalier King Charles Spaniel puppy from one of our past litters. Notice the perfect markings! 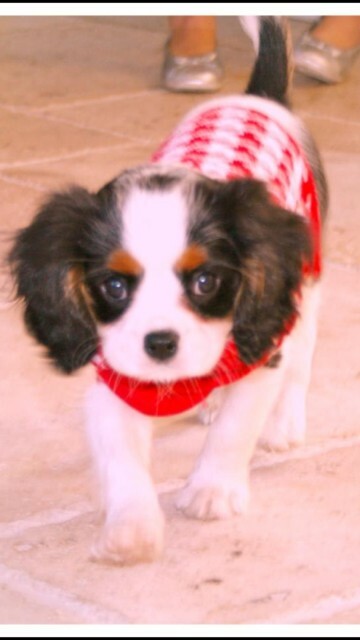 Robbie’s Rosewood Cavaliers offers quality Cavalier King Charles Spaniel Puppies For Sale in Florida. We ship within the USA. Caring and conscientious Cavalier King Charles Spaniel breeders in Florida, Robbie Mueller breeds and raises Cavalier King Charles Spaniel puppies for sale in Florida to approved buyers. Robbie’s Rosewood Cavaliers specializes in breeding top quality, registered Cavalier King Charles Spaniels for loving, responsible owners. All puppies come from champion bloodlines, and are health certified and guaranteed. The puppies are raised in our home with our family, and are well socialized with children and pets. Our Cavalier King Charles Spaniel puppies are registered with the American Kennel Club. Our puppies are lovingly raised in our home. They are brought up as members of our family and our 3 children lavish them with time and attention, not to mention love! If you are looking for a wonderful puppy for your family, a Rosewood Cavalier puppy is an excellent choice. Purchasing a good quality dog is just like purchasing anything else in this life, you get what you pay for. Your primary concern should be the health and temperament of the puppy you purchase, NOT the price. “A cheap dog is only cheap when you buy it”. Our Cavalier King Charles Spaniel dogs and puppies are registered with AKC. We are members of American Kennel Club. Our Cavalier puppies can be shipped to approved homes within the USA at buyer’s expense, weather permitting. 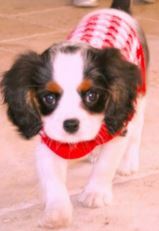 If you are interested in adding a quality Cavalier puppy to your family, then please feel free to contact us by email.